This is Samsung's debut DLP front projector and it's not a piece of kit you're going to easily miss with its hefty bulk demanding a permanent and secure home. That said, its silver design is attractive and sleek enough to not offend the eye. It doesn't have an HDMI input but makes up for this deficiency with one for DVI and a pair of component inputs so it's covered on the HD Ready front along with its 1,280 x 720 resolution. Other sockets include S-video and composite and a PC D-Sub input. Annoyingly, the DVI jack has an in-built snobbery to standard-definition sources with neither 480i nor 576i inputs accepted, which may affect those who want to watch SD fare before hi-def completely takes over the world. Setting up the SP-H710AE is a pleasure. It's been designed thoughtfully, from the backlit remote control, to the onscreen menus it complements that are simple and logical to work through. 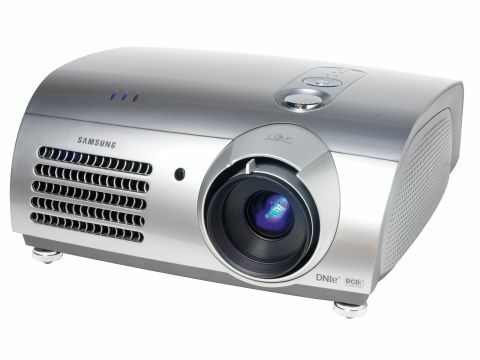 Features of note include vertical keystone adjustments and lens shift, 700 ANSI Lumens of brightness, a Theatre mode that limits fan noise to 20dB and the capability to throw a 100-inch image from a throw of between 3.4-11.1m. You also get colour temperature and gamma controls, DNle processing and low and high settings. DNle video processing is an advanced extra brought over from the company's TV range but while this is a function we expect to help deliver premium pictures, we liked the way the projector is made to be as flexible as possible in a variety of circumstances and environments. So we were pleased to find our first impressions living up to our expectations. Colours were brilliantly rendered with great depth and accuracy. While the £2,400 price tag is nothing to be sniffed at - it seemed pretty good value when we looked at the subtle, credible tones it was able to reproduce. Likewise, black levels were carefully graded and impressive enough to make us wonder whether LG was under-selling itself with its stated contrast ratio of 2,800:1. Fine detail was also of the highest standard picking out finely the great ape's lined palm and furry brow in King Kong. The only real picture problems concerned the occasional presence of rainbow effect, while we noticed that some horizontal pans were not processed as smoothly as with other rivals. Another problem with projectors such as this, not fully adapted for home cinema, was a high-pitched hum that spoiled the otherwise quiet running of the projector. These quibbles aside, it represents great value for money.